Beginning this article has been somewhat like the production staff at Kensington Communications deciding which museums to feature in their first six episode run of Museum Secrets. As Series Producer Steve Gamester told me in a recent interview “choosing the museums was really like an embarrassment of riches, there were so many to choose from.” The team knew that they wanted to include at least one Canadian museum along with other well-known historic icons. Like Kensington, I have a wealth of information for this article, and the challenge has not been in writing it, but in putting it all in context and conveying my impressions of the series without sounding like the avid series fan that I really am. 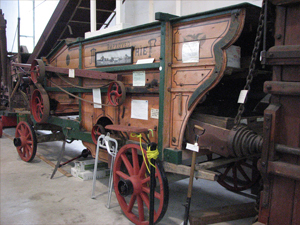 This is something I could relate to, as my family has lived in this area for over a century and has many historic ties to the town, including an old thresher which is in the BC Farm Machinery and Agricultural Museum in Fort Langley. The thresher belonged to my great-great-grandfather, and was involved in some cross-border shenanigans with farmers and the sheriff’s department just across the border in Washington state. I wasn’t aware of the story until our historic society included it in one of their published area histories, and we’ve since been down to visit the thresher at the museum. 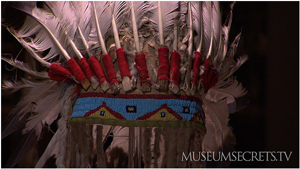 As a first example, Ernie La Pointe, great-grandson of Sioux chief Sitting Bull, was interviewed about his famous ancestor and the beautiful antique headdress in possession of the Royal Ontario Museum. 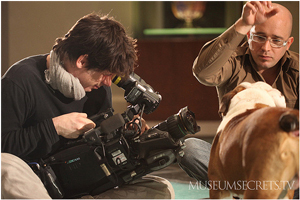 The Royal Ontario Museum episode was the first of the series to be filmed, and it was here that the crew fully realized the personal attachments curators can develop with the artifacts. Egyptologist Gayle Gibson is emphatically passionate about her work with the ROM’s Egyptian Collection, and it is obvious in the segments examining the Egyptian mummy babies that every artifact carries with it some essence of humanity, and the curators echo that humanity in their treatment and care of the artifacts. Every episode of this first series has thus far succeeded in showing how these moments in our history still have some type of impact on those living in modern times. One such interview was with Charles Napoleon, descendant of the youngest brother of that famous little tyrant, Napoleon Bonaparte. A new level of interest was definitely added to the Louvre episode when the story of the propagandic Jacques-Louis David painting of Napoleon’s coronation is told by the man who could have been the current monarch of France, had history played out differently. 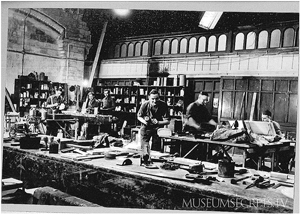 Another segment aired during the episode on England’s Natural History Museum. Who doesn’t love a story about a cursed, priceless gem? Apparently the descendants of Edward Heron-Allen don’t. 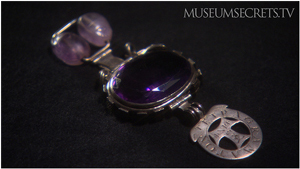 The Blasted Amethyst was gifted to the museum after decades of mysterious and nefarious events seemed to surround anyone who owned or touched the gem, which had been looted from the Temple of Indra during the Indian Mutiny of 1857. Most interesting during this segment was the skepticism of Mineralogist Alan Hart, who does not believe in the curse, and the opposite opinion of Curator Richard Savin, who firmly believes the gem has exerted it cursatory power on his life. Ira Jones, the son of Edward Heron-Allen, was offered the opportunity to handle the purple treasure before it was replaced in its display case. He declined. 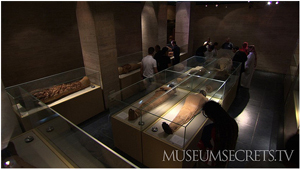 While he did have the opportunity to handle some of the artifacts at the Egyptian Museum, series producer Steve Gamester did not lay hands on the gem either, but he did note that one of the show’s cameramen fell ill the day after the segment on the gem was shot. Coincidence or Curse? 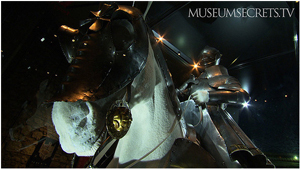 Museum Secrets also takes the science behind some of the artifacts out of the museum and into the real world. Two segments which immediately stand out are the ones where the crossbow and musket go shot for shot in power comparisons and the top secret weaponry employed by Britain’s Special Operations Executive. Who knew that rats could be so explosively deadly? What made the crossbow segment of the ROM episode so special was the opportunity for Curator Cory Keeble to actually shoot a replica crossbow which had been built to medieval specifications by prop master Chris Warrilow – and his delight in doing so. 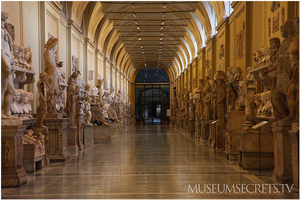 I have purposely left two episodes of the Museum Secrets series until last, because the Vatican Museum is one archive I would love be to turned loose in, and The Met has ties to secrets the Vatican would like to keep. No, I’m not a Da Vinci Code or Angels and Demons fanatic – I’ve spent decades wondering what secrets are hidden away behind the thick walls of the Vatican. 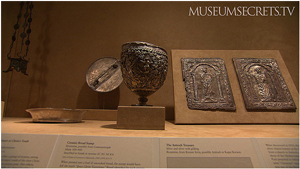 The Met was recently featured as a backdrop location to another conspiracy-based movie, The Last Templar, so I found some of the artifact choices by the Museum Secrets team intriguing simply because of the tie-ins to the whole Templar-Vatican story. During my interview with Steve Gamester, he said that even with all of the preparatory research done before going on location, there is still the possibility of stumbling upon one special gem, the impact of which you don’t fully realize until you are on location. As he noted elsewhere in our conversation, many of today’s museums did not start life as a museum, and thus have additional stories aside from the ones on display. One of Steve’s favourite segments was the graffiti left behind in the Vatican by the looting army of Charles V, Holy Roman Emperor, when it sacked Rome in 1527. The graffiti was particularly intriguing, because members of the army had actually taken the time to scratch in the name of their leader, defacing frescoes which had been created by master artist Raphael. When we were discussing the Vatican Museum, I asked Steve which museum he would like to have unfettered access to, and he replied that one of his top choices would be The Hermitage in St. Petersburg, which is another museum I would love to visit one day, as part of my family came from Russia, escaping soon after the deaths of the Romanovs. Steve mentioned that he has also been researching Topkapi Palace in Istanbul, as he also has an interest in the Ottoman Empire. This conversational line led to my asking Steve which period in history was his favourite, to which he replied Ancient Greek, and lucky for him, the crew is currently filming a new Museum Secrets episode at the National Archaeological Museum in Athens. I asked him if they would be filming any segments at Santorini, and to my disappointment, he didn’t think so – but they would be taking a look at the legend of the Minotaur and the mysterious labyrinth. 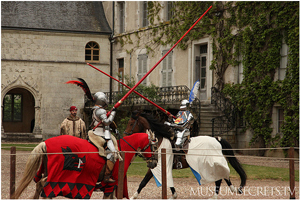 If you haven’t done so yet, I invite you to visit the Museum Secrets web site, because it is full of interesting things to learn and things to do. The interactive designers at Kensington have given viewers the chance to play with digitized versions of crossbows. There is also a feature called the Object Navigator, which allows you to look at the museum objects in detail and learn more about them. There are also non-featured artifacts sprinkled among them, and you can even save the objects to be looked at later. While the Object Navigator and My Discoveries features do require that you register on the site (if you want to save your lists), once you do, you can also make notes to go with the objects, and you can share them with others. There are many interactive components to be found on the web site, and while I could tell you where they all are, I think it would be more engaging for you to explore the site and find them as you go along. Every segment also has its own short feature video to also give you a closer look at areas of interest to you, complete with the distinct animated segments used to describe historical events. I asked Steve about those segments, because to me they look reminiscent of the Monty Python shows, and I wondered if this was a kind of homage to those comedic creators of other …historic films. Steve answered that the team wanted a graphic novel feel, somewhat “Frank Miller-ish” to the animations, and that they were simply trying to find a signature way to portray historic episodes without using full CG, as well as stay within the budget. There was no resemblance to Monty Python intended in either the crossbow game or the show’s animated segments. 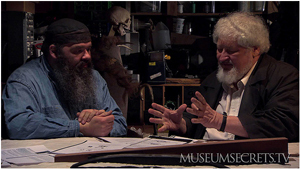 The Museum Secrets blog offers a behind-the-scenes looks at every episode, and a chance to hear from that episode’s director about the various locations. Speaking for myself, whose interest in history is probably only equaled by my interest in video games, Museum Secrets is one of the most original and educational series to grace the airwaves, and I enjoy it all the more because it’s made in Canada. These are the types of programs I am happy to see my tax dollars support, and I hope that we are given the opportunity to see many more episodes in the future. 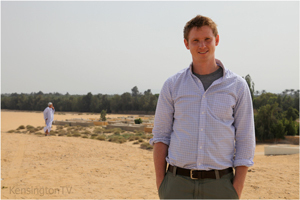 Museum Secrets, produced by KensingtonTV with the participation and support of the Bell Fund, History Television, and the Canada Media Fund, currently airs on History Television (Canada), and will be airing in the near future in both the United States and Europe. 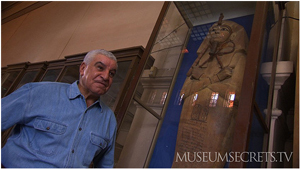 The Museum Secrets team also welcomes input and feedback from fans on both its Facebook page and Twitter. Aside from the video on the site, you can also check out video on the Museum Secrets’ YouTube channel and see location stills on Flickr. In addition, Kensington’s founder Robert Lang and Interactive Producer, David Oppenheim, will be presenting a talk on creating films for multiple-platforms, including mobile devices at NXNE’s Interactive Festival. This entry was posted on Wednesday, March 9th, 2011 at 11:53 am and is filed under Editorials, National News, Studios. You can follow any responses to this entry through the RSS 2.0 feed. You can leave a response, or trackback from your own site.